Eater reported that the popular food delivery service Maple (which counts David Chang as one of its investors) has just expanded to south Midtown. And while I expected this to be an over-priced fancy schmancy delicery service, it sounds like it could be a true Midtown Lunch option if you’re willing to splurge by just 2 bones. Every day, you can choose from a list of chef-prepared dishes like shrimp biryani and cumin-roasted chicken breast. The food will be delivered to your office (assuming you work in the delivery zone) for $12 total. Tax, tip, and delivery fees are included and they guarantee a 30 minute delivery time. The added delivery zone is between Eighth Avenue and Park Avenue anywhere between 14th and 42nd Street, but I imagine that will expand in the future. There are also desserts available from Milk Bar’s Christina Tosi and Ample Hills ice cream. Check out the website and app by clicking here. I think it’s fair to increase the ML budget to $12 for this, but what remains to be seen is if the food is worth it and the portion sizes match the price. Anybody have a chance to check this out yet? Leave feedback in the comments below. Posted by brianhoffman at 11:43 am, January 7th, 2016 under Maple, Momofuku. Happening Now: Holy Fuku+ Are You Guys Serious??? This morning, Brian reported that David Chang opened a second location of his super popular ridiculous fried chicken sandwich East Village restaurant, Fuku, in Midtown North-Central. As expected, people are going ape over this. I put my prejudices aside to check out the line and the space. Pictures, menu, details, all after my soul dies a little and after the jump. Posted by Yvo at 1:57 pm, September 10th, 2015 under Momofuku. Grub Street just reported that David Chang has surprised everybody by opening a second location of his hugely popular fried chicken spot Fuku in Midtown today. 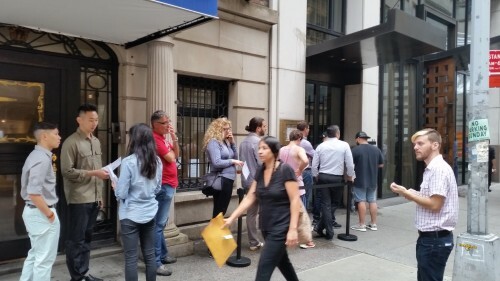 They open for the first time at noon and I imagine the lines have already begun to form at the Chambers Hotel on 56th Street, the same location as Ma Peche. This location seems to focus on fried chicken bites called Fuku bites, along with other confusing menu items like Sichuan Pork Flatbread and Salt & Pepper Shrimp. No prices are listed, but the full menu can be seen here. There are also package options that are by reservation only and include a sandwich, salad, fries, and other goodies. There is an XL for 2-6 guests at $25 per person or an XXL for 4-8 guests at a total of $400. Office party anyone? Early adopters and line waiters, leave your reports below. Posted by brianhoffman at 11:56 am, September 10th, 2015 under Momofuku. 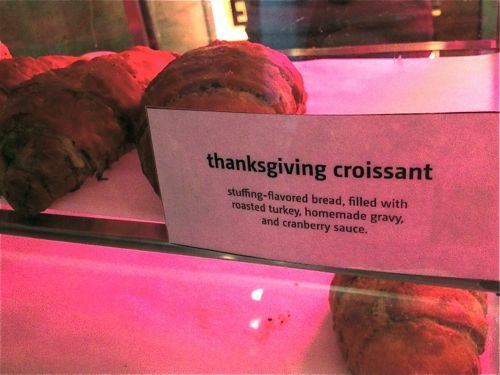 Don’t Forget To Get Your Thanksgiving Croissant! Now that we’re more than half way through November, it seems like a good time to reminder ML’ers that fans of Momofuku‘s annual Thanksgiving croissant should make their way to Milk Bar inside Ma Peche (on 56th btw. 5+6th) ASAP. The stuffing-flavored pastry filled with turkey, cranberry sauce and gravy won’t be around for much longer. I had one for the first time recently, and it was worth every penny of the $4.50 I paid for it. Posted by Rachel Goldner at 9:00 am, November 19th, 2013 under Momofuku. The annual Thanksgiving Croissant, featuring turkey, cranberry sauce, and stuffing baked inside a croissant, is back at Momofuku Milk Bar (on 56th btw. 5+6th) starting this week. Very exciting news indeed… but you’ve got to get their early. 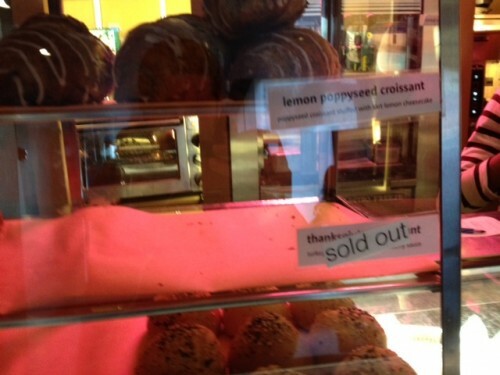 They were sold out by the time I stopped by at 12:30pm today. Posted by brianhoffman at 1:36 pm, November 9th, 2012 under Momofuku. Drink at Ma Peche For the Red Cross: No Happy Hour post for this week, but here'a little tidbit for those of you still in Midtown after work today... not only is Ma Peche (aka Momofuku Midtown on 56th btw. 5+6th) donating today's proceeds from lunch and dinner to the Red Cross, from 5pm to close they will serve Booker & Dax cocktails at the bar, also to benefit the Red Cross. Momofuku Milk Bar’s cookies used to top my list for funky cookie creations in Midtown, but then Schmackary’s burst onto the scene earlier this year and stole my heart. These two spots each have their own unique cookie combos, but I recently realized that they have something in common: the corn cookie. Well, there’s a clear way to make a comparison — let’s give it a shot. 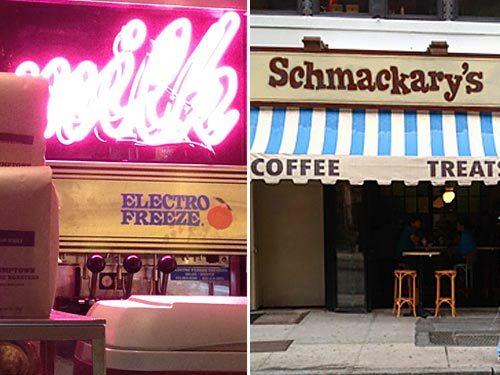 Posted by Rachel Goldner at 1:00 pm, October 5th, 2012 under Momofuku, Schmackary's. 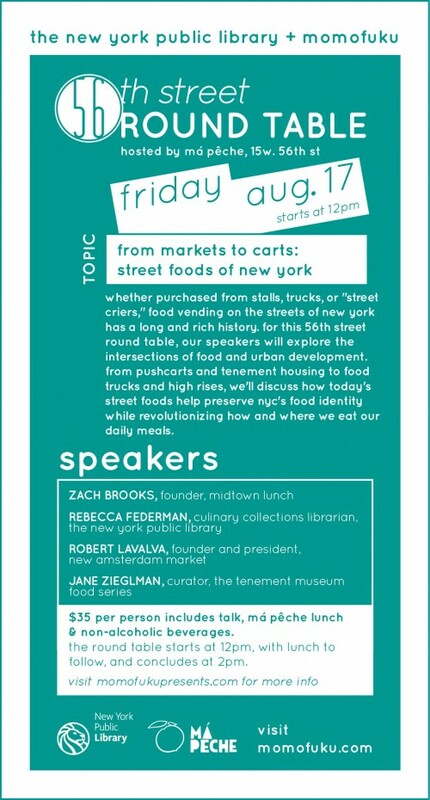 Posted by The ML Team at 1:15 pm, August 2nd, 2012 under Momofuku. Summer is not when I crave ramen, but we are about to blessed with some serious noodle additions to Midtown. Grub Street announced yesterday that the second locations of both Totto Ramen (on 51st and 10th), which we mentioned a few months back and Tabata Noodle (39th bw 8th and 9th) will be opening very soon. Both are just slightly out of bounds, but if the food remains as good and the locations are indeed larger, it will certainly be worth the walk. Back in Midtown proper, but a bona fide splurge, comes the exciting discovery that Ma Peche now seems to be offering both beef and duck ramen on their delivery menu. 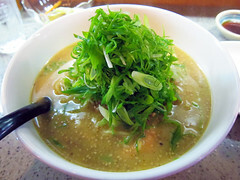 Posted by brianhoffman at 9:00 am, June 6th, 2012 under Momofuku, Tabata Noodle Restaurant, Totto Ramen. If you’re into large, splurge worthy Midtown dinners you’ll be excited to hear that Ma Peche (on 55th btw. 5+6th) has introduced 2 new large format dinners to their menu. But that isn’t the only news to come out of Midtown’s Momofuku today. We hinted at it a few weeks ago when we looked at Ma Peche’s new lunch options, but today it becomes official. You can now have Ma Peche’s take out lunch menu, featuring sandwiches, buns, small plates, and Milk Bar cookiesfor delivered to your office. 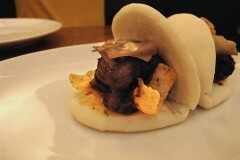 Posted by Zach Brooks at 1:15 pm, May 30th, 2012 under Momofuku.